One of the most powerful things I can do for my students is work to promote reading for fun and helping students find books that they will enjoy. I feel like middle school is one of those key times in life where many students either take the path to become a life-long reader…or not. So I try to do as much as possible to talk to my students about what they’re reading and help them find books that will get them hooked! 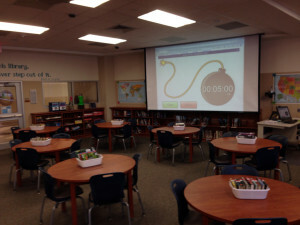 One activity that I’ve found to be extremely successful this year is a round of “Book Speed Dating.” I know that this is an activity that many librarians have done for years…it’s tried and true for a reason! I pulled books that I frequently recommend from 7 different genres and put them in boxes at each of my 7 tables. It exposes readers to new genres that they may not seek out on their own. Students come in and decide on a ranking system they’ll use to rank the books they preview (scale of 1-10, five star ratings, etc.). I set a timer (like the one projected on the screen) for five minutes. For the first 30 seconds, they can peruse the books in the box at their table and select a book. Then, they spend 4 minutes reading the book to see if it hooks them. With 30 seconds remaining, they make note of the title of the book and give it a ranking. If at any time they find a book they want to check out, they can hold on to that book. All other books go back in the box, we rotate the boxes, and repeat this activity 4-5 times. I always get great feedback from teachers and students with this activity…they love it! By the final round, about half of the students will typically have a book that they want to check out. And ALL of the students have spent some time with a book from a genre that’s outside of their typical reading comfort zone. I did this several weeks ago with my 8th graders, and this week the 6th graders are having their turn. I especially like that I can customize the boxes for the classes/grades that I have visiting. And I LOVE that lots of book replenishing is needed after each class! Do you do something similar to this? What other tried and true activities do you use for the love of reading? I did something similar at our high school last month. Classes were coming in for the library orientation and to choose a book for free reading. I put selections of books of different genres on each table. In the first class, I noticed that the books I had set out (great books!) were completely ignored. So for the next class, I changed things up and had them decide as a group which one was the most popular choice at the table. Then they had to give an impromptu book talk based on the limited information they had – what was it about the book that appealed to them? What did they think it was about? etc. The books went from being ignored to about 30% checked out. Students still come in looking for the books someone else got before they did. I like the speed dating idea, though, because they don’t have to decide as a group (I did that because of time limitations) . Looks like a great way to get students to interact with a lot of books in a short period of time! I heard you speak at the ISLMA Conference last weekend and was incredibly impressed with all of the great things you are implementing at your school. After reading your post about book speed dating I decided I had to try it out! I set up 5 tables with different genres of books for my 4th graders. They followed the procedures you mentioned: selecting a book after browsing at the table, reading for several minutes and keeping books they wanted to check out. I completely forgot about the ranking system aspect and would be curious to try that next time to see what it adds to the mix. I was thrilled to have 44 of the books I placed on the tables for speed dating get checked out by my 38 4th graders! They were all very excited to have found some new things to read and I was thrilled to see so many different books walk out my door. Thank you for inspiring me to try something new this week! I’ve read about book speed dating before, but really appreciate the details of how it worked for you. This is one I’ll have to try soon. Thanks. Hello Tiffany. I was lucky enough to see your talk at FAME this year- good stuff! I am in a new position this year as the Middle School Librarian at a private school. Prior to this, I served a K-12 charter school as their K-5 Librarian and Technology Teacher, and their 6-12 Librarian and Research Teacher- all at once! Before that, I was a Public Librarian specializing in ages birth to 5- singing, storytelling, and playing with puppets. I am used to being SO busy in a very planned out way. Now, I have the freedom to run a library and create a program from the ground up. I will be teaching a Research Skills class on their 6th grade wheel next year but, until then, the students have no scheduled time with me. They come in as they need to. I have completely updated their collection- making it much more desirable for their age group. Weeding the collection and replenishing it has taken most of my time. Now, I am ready to start devising activities to engage the students in reading and to enrich the library culture. How do you accomplish this in an unscheduled environment? I would love to do this speed-dating activity but I would need to invite students to attend it during their activities period. Have you done this with a voluntary audience before? I look forward to hearing back from you. I’ve actually put myself on a flex/fixed schedule. Language Arts teachers bring their students to the library on a regular schedule — every other week for 6th and 7th grade, every third week for 8th grade. I’m flexible with the teachers in the amount of time their classes visit and the activities that we do (they often request that I do an activity on a specific topic, although I sometimes have freedom to do an activity of my choosing like book speed dating). I struggled with not seeing all of the students on a regular basis, so this was the best way that I could make things work. I hope this helps! Let me know if you have any other questions. I have been looking for some activities to shake up my book clubs; they are good groups and we have lively discussions. Still, I look for ways to shake things up now and then. For one club, in July each year, everyone brings a book to share with the group. This year, I am asking the members to give an elevator speech about the book, not more than two minutes long; I limit that discussion because of the large number in the group and the desire to have everyone share his/her book. I vary the instructions each summer. I really like your idea of book speed dating and will try it with the group soon. Thanks for the inspiration! I am a retired educator, active in several book clubs, so I am always looking for good ideas to share with my groups. I am also a member of the Friends of the Library Board and like to find ideas to share with that group.